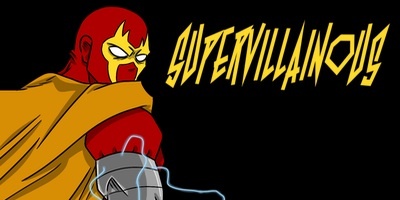 Supervillainous – The Crimson Claw is a family man, fiercely devoted to the people he loves, and…largely indifferent to the rest. He’s a well-known supervillain who played the game the smart way, and built both a home and one heck of an arsenal. In the capes world, life can be chaotic, and it’s not easy to raise a family. The Crimson Claw, however, is hardly the type to back down from a challenge. 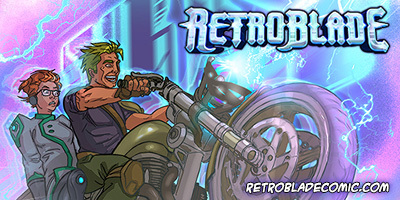 Retroblade – In the year 3007 a reality crash has wiped everything out. The last known survivor, Axel Kepler is working his way backwards through time, trying to figure out where it all went wrong. With a severely out of touch Database, a Transmutation Device for food (that if anything, makes molecules less edible than they were before) and only a cryptic Blueprint left by his sister to guide him, he needs help… He needs a Team. Together, they will find out how to fix things, who the good guys really are… and why people from the future have such cheesy haircuts.